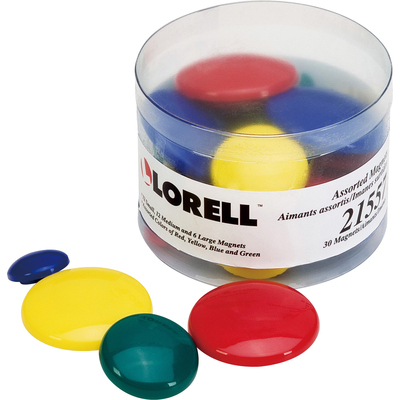 Handy, Plastic Tub Contains A Colorful Assortment Of Magnets To Post Notes On Your Magnetic Boards And Other Compatible Surfaces. Assortment Includes 12 Small Magnets, 12 Medium Magnets And Six Large Magnets. Colors Include Red, Yellow, Blue And Green. Plastic Tub Is Clear For Easy Identification Of The Magnets Remaining For Your Use..